Happy Thursday. Brace yourselves, there are going to be several posts going up on FFLibrarian over the next few days. Let's kick things off (ha!) with a look at kickers for Week 12 with a guest post from Bob. Whew, Week 11 was a tough week for the projections. It was a down week overall for PKs, maybe the weather had something to do with that. If you owned some of the high % owned teams you did pretty well averaging 10.2. 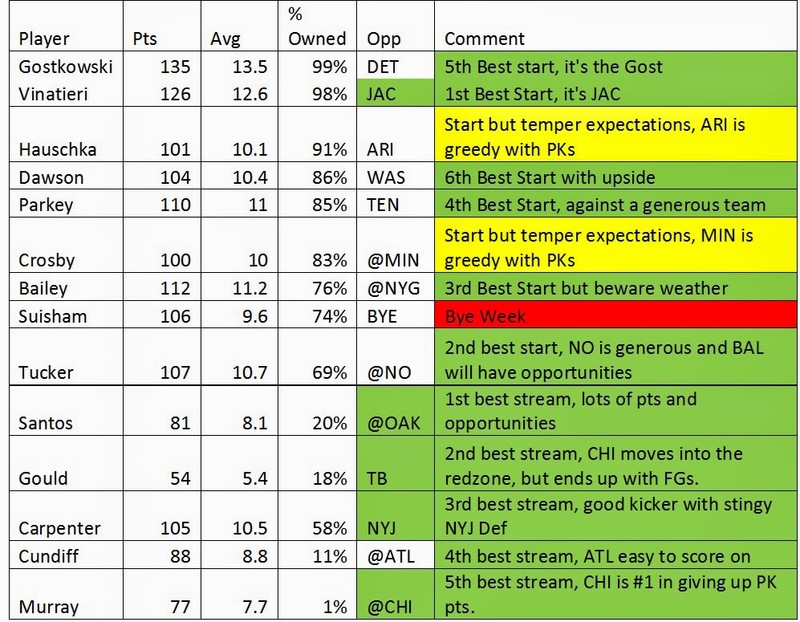 But if you started one of the two teams I mentioned as temper expectations, you did best, with Parkey and Crosby. The top three scorers were owned in very few teams so most didn’t benefit with the outputs. But I won’t dwell on my demise last week and look toward a comeback for week 12. (Sorry about that Forbath recommendation…) Here’s the Week 12 analysis. Only one highly owned kicker, Suisham, is on a Bye. I really like Cairo Santos this week, against a generous OAK team that is playing good pass defense. So expect some of those grinding KC drives with the RBs to stall in the redzone and provide opportunities for FGs. Robbie Gould should see a lot of opportunities in an arena that could be pretty cold weather wise again. TB is generous to PKs and CHI has had problems finishing drives. Buf is going against the unpredictable Jets, and this could be a big defensive battle with both teams taking the points when they can get them. Pick Carpenter as a quality kicker at home in a game of opportunities. Cleveland’s defense is doing a great job especially against the pass, so they should see an ample amount of possessions and drives that fall short of the end zone. Cundiff makes a sneaky start this week. And on to the flyer. Just as Robbie Gould will benefit from a low scoring affair, so too will Patrick Murray. He is only owned in 1% of leagues?! He’s a decent kicker against the #1 team in giving up PK pts. So that’s it for Week 12, if you don’t own one of the 8 highly owned PKs this week consider the following as starts, in the following order: Santos, Gould, Carpenter, Cundiff, and Murray.